A special curriculum that includes music and individualized exercised makes Move With Balance particularly effective for patients with cognitive and functional difficulties. Alzheimer’s disease is a fatal disease that eventually affects all aspects of a person’s life: how they think, feel, and act. While the effects of Alzheimer’s are irreversible, Move With Balance can help prevent the early onset of many symptoms. Alzheimer’s disease is not a normal part of aging. Three consecutive grants (2015, 2016, 2017, 2018) from the Alzheimer’s Foundation of America (AFA) has allowed Giving Back to develop a model for clients with dementia and Alzheimer’s. The program integrates music, rhythm, timing, sound, singing, songwriting into the Move With Balance activities. 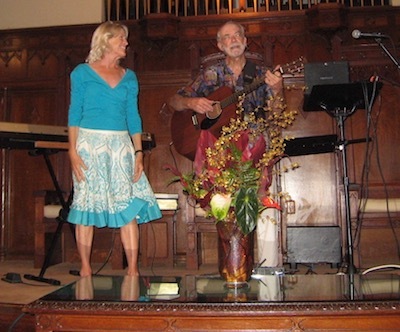 Our amazing musician, Bill Fuller, is familiar with the research on music and Alzheimer’s, and has updated and adapted the lyrics of oldies to match our exercises. Read more about exercising with music. Besides each Alzheimer’s mentee having their own mentor, we include family caregiver(s) in our program by having them attend the classes with the mentees. We are encouraging the whole family be involved, including children. 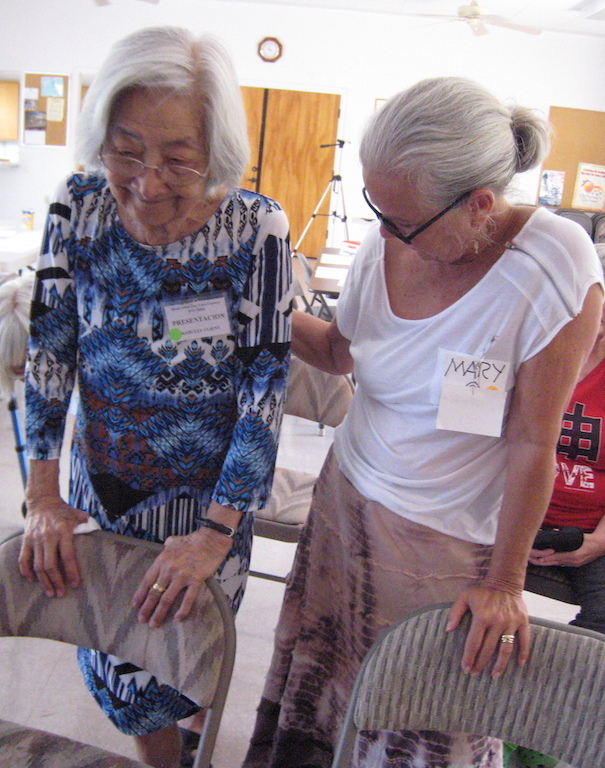 We also train family caregivers in the techniques so that they can continue the activities at home after they and their loved one participate in the 10-week group session. We have found they do the exercises between classes, and the results show. Fit elder mentors individualize the exercises for the mentees. When the mentees feel safe in a loving atmosphere, they are willing to do the activities. In fact, they really get into focusing in tthe moment, and become present and alive. Their demeanor changes as they participate, sing, move, and learn new things. 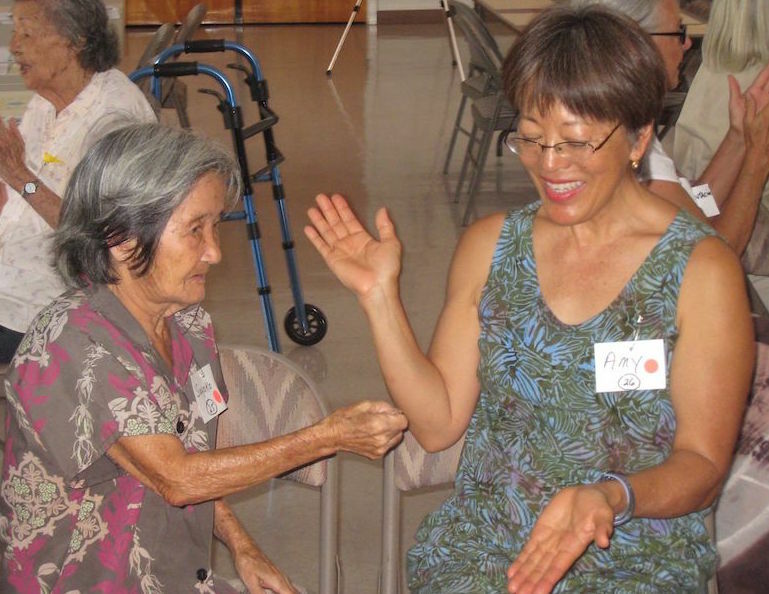 Learn how to adapt the exercises to the functional needs of your elder. Are you a professional or family caregiver and would like to teach an elder how to prevent falls and enhance brain function? Learn how. Find out how state departments and health organizations can set up a group program in their entire state or in their community.